The 435-foot radio tower (other sources indicate the tower was approx 160-foot tall, which appears plausible based on the photos below) was no match for the B-29 that hit it going about 140 miles per hour at 3:12 p.m. on April 3, 1956. The airplane took off from Randolph AFB headed northwest on a routine training mission only a few minutes before the accident, with six men aboard. Eyewitnesses said the plane was flying unusually low when it struck the WOAI tower on the old Austin Highway near Selma and crashed and burned in a cornfield three miles northeast on Nacogdoches Road. Farmer Rene Calle "was watering potatoes and cussing the dust when it happened," says the San Antonio Express, April 4, 1956. "It was burning like the devil," Calle said, "and I was ready to run, only I didn't know which way to go." He had watched as the plane tried to turn and fell from the sky. "It was burning all the way down," he said, "and when it hit, the flames popped up hundreds of feet. The noise was terrible." Amazingly, five of the Air Force personnel aboard walked away from the crash, and attempted to aid the airman who was thrown clear and killed on impact. At the controls was 1st Lt. L.R. Hildebrand, who must have been cussing the dry weather at least as much as the farmer below. "It was somewhat hazy, with a reddish-brown dust in the air," the aircraft commander told the Express, April 5, 1956. His first thought on spotting the obstacle, he said, was "How could that tower be there? Then I saw it was impossible to miss it by going up, turning right or left." As Hildebrand saw it, the tower was "a dirty-orange color, and blended with the background, it had the effect of being camouflaged." The plane's right inboard engine hit the tower about 50 feet from the top, tearing the engine away and toppling the tower. 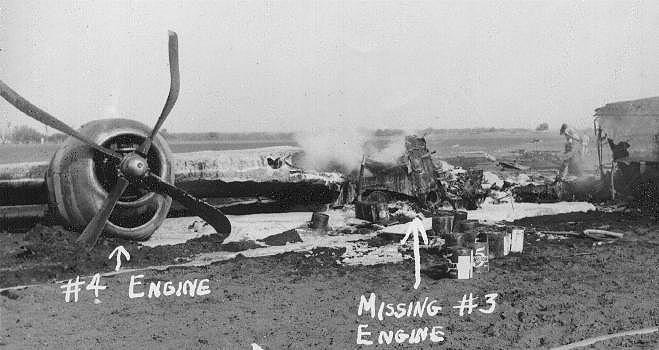 With three remaining engines and both wings intact, the airplane was controllable, and the crew put on their seat belts and went into crash-landing procedures. 1st Lt. R.E. Skiling, who was giving Hildebrand "specialized instructions" on the short flight, took command, radioed the Randolph Tower and determined that the empty cornfield was the safest place to land, although it was "comparatively small for a B-29." Named the Superfortress by aircraft manufacturer Boeing, the huge plane was a long-range bomber that saw military service between 1942 and 1960. "As many as 1,000 Superfortresses at a time bombed Tokyo," says the plane's history on www.boeing.com. The most famous B-29s were the Enola Gay and the Bockscar that dropped atomic bombs on Hiroshima and Nagasaki, Japan. The postwar version of the plane weighed 140,000 pounds and was used for weather reconnaissance and rescue duty. When the one in the WOAI tower crash hit the ground, Skiling "set it down rather smoothly," said Hildebrand, "but (the plane) was burning intensely, and the fuel spread even more." After skidding around 1,500 feet, the B-29 came to a stop and the crewmen still aboard struggled out. Calle and his brother Joseph ran over to help, but one of the Air Force officers told them to get back in case the plane exploded. The crew members found their fallen comrade, Airman F.B. Gibbons, and moved his body away from the flames before being taken away in ambulances that arrived on the scene along with firefighters. Meanwhile, about 77 Hereford cattle on an adjacent field stampeded, jumping the fences and heading toward the road until they were rounded up by area farmers. About 25 acres of the corn at the crash site were lost, not only due to the plane and the fire but to the emergency vehicles and the crowd of onlookers "attracted by scores of screaming sirens and a pall of black smoke." WOAI radio went off the air for only about two minutes, until a downtown auxiliary transmitter went into operation. After discussion with Air Force officials, the station took only three weeks to rebuild its tower at the same height and place, says the San Antonio Light, May 8, 1956. The Towers and Masts directory. 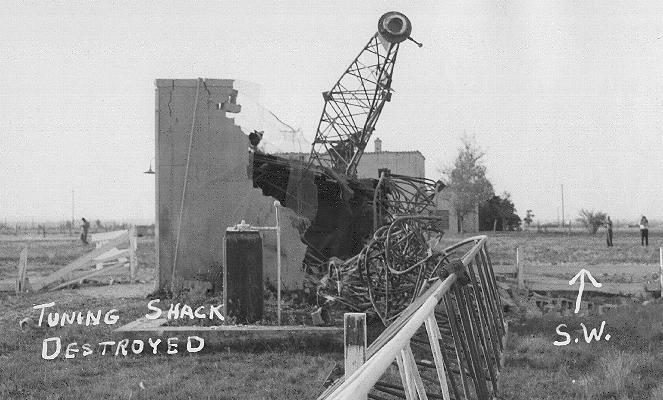 The series of photographs show the wreckage of a B-29 that collided with WOAI's radio tower on April 3, 1956. Do you have more? - please help !